You are here: Home / Education & Parenting / Math / Addition / Addition Facts Practice Ideas–Make it Fun! 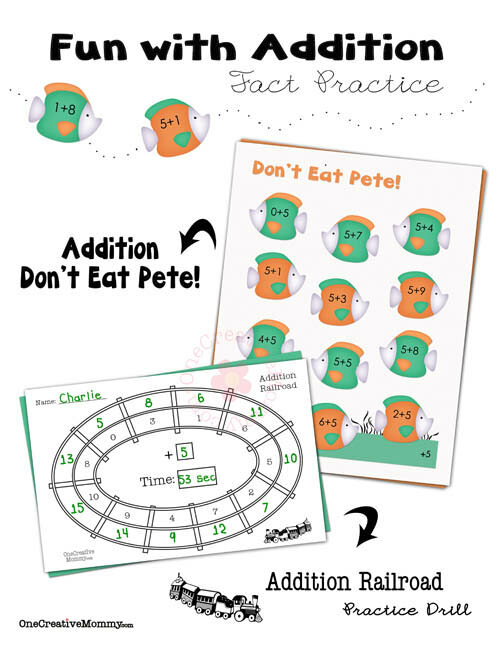 Addition Facts Practice Ideas–Make it Fun! Monday, I shared some ideas for practicing multiplication facts over the summer. Too bad those won’t help the younger kids. But wait . . . I didn’t forget them! Today I’m sharing fun addition facts practice ideas! When you’re ready to start, get your timer ready and have your child write the fact family number in the box next to the + sign. This is the number they will add to each number around the train track. When you say, “Go!” your child can start adding anywhere along the racetrack. He or she adds the center number to the numbers on the inside track and writes the answers in the corresponding empty spaces on the outside track. Stop the timer when they finish, and record the time for the drill in the columns to the right of the corresponding fact family number. Once your child reaches the goal time, they can start on the next fact family. It may not sound very exciting, but kids love this! They thrive on the routine and on setting and reaching goals. Paper-saving hint: Instead of making hundreds of copies of the drills, we make one copy of the drill page (there are two drills on the page) and put it inside a plastic sleeve. My kids write the answers using a Vis-a-Vis wet erase marker, and then erase them with a damp paper towel when they are finished. (When they practice, they do each drill twice in a row. That helps them improve their speed quickly.) We keep the progress chart inside the sleeve, too, so that it doesn’t get lost. Want to try these drills with your family? Because the download process was a pain for you, and it slowed down the site a lot, my shop can now be found on TeachersNotebook.com. I am no longer selling products from this site. 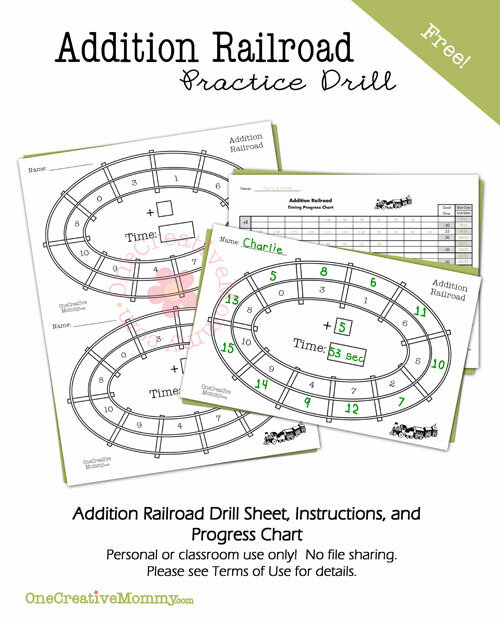 Click the download box below to go to my Addition Railroad post and download the drill. Would you believe that my kids actually play math games when they are bored? Tonight they (ages 11, 7, and 6) sat around a little table and played Don’t Eat Pete for an hour! No arguing. No mess making. Just learning and playing together. (One used division boards, one used multiplication boards, and one used the addition boards I’m showing you today.) It helps that we used real pennies as markers, and they got to keep the pennies they earned. 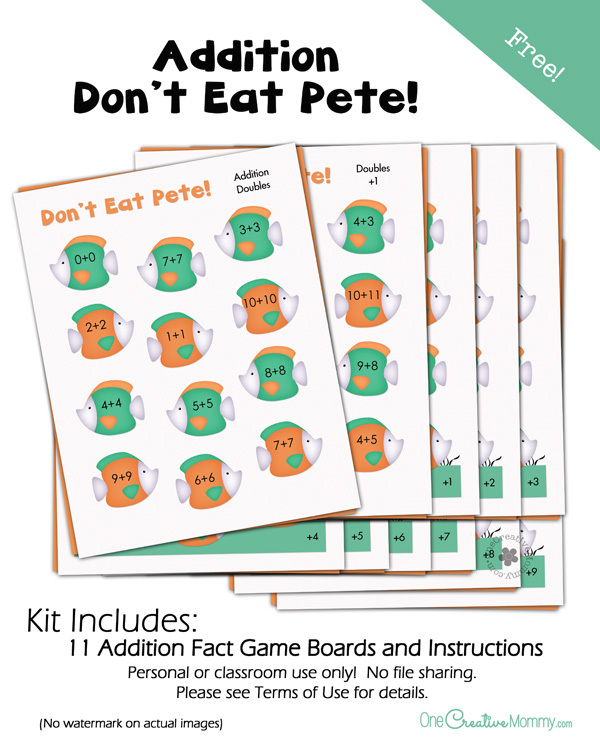 Click the download box below to go to my Addition Don’t Eat Pete post and download the game for free. Want more summer learning ideas? I’m planning a roundup of ideas from all over the web! Be sure to come back to check it out. I was trying to download the additions railroad but had some trouble. It looked like during checkout my previous order of the multiplication speedway was being brought up instead of the addition. Also, with my confirmation email, it seems as though the multiplication speedway is what came through again (but without a code attached to the email to). Not sure how to proceed to obtain the additions railroad. Thank you, Heidi for your help!! !